← The Problem of colour! 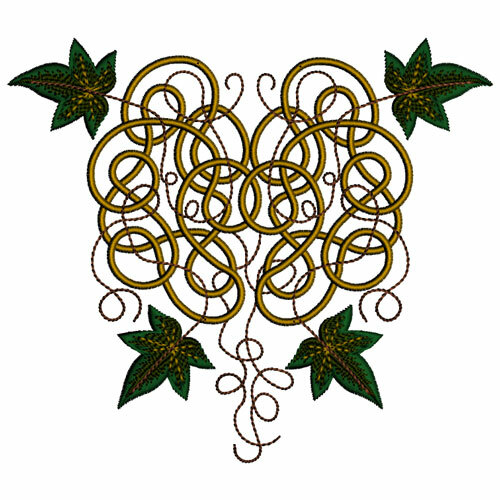 Early in my digitising I started creating Celtic Designs as I found them so fascinating and there are not many to be found in the machine embroidery market. 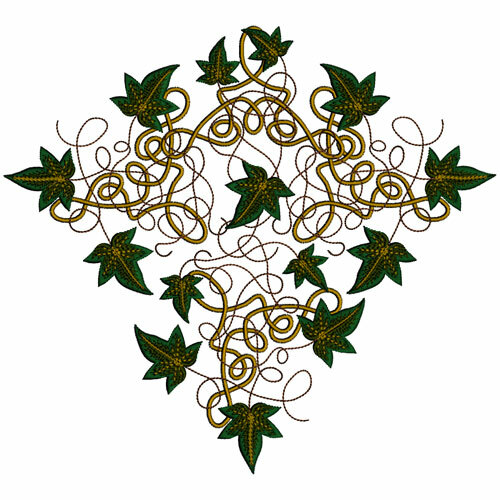 So far I have created the Celtic Dreams collection, the Celtic Christmas collection, the Celtic Grace collection and the Celtic Knot Work collection. Ivy is a woody invasive evergreen plant that has a delightful tendency to creep and climb gracefully up other plants and trees. 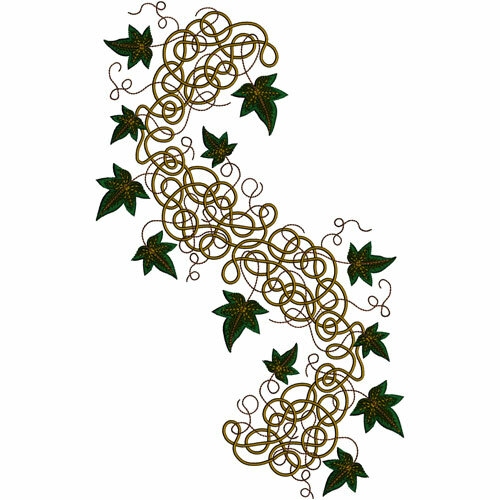 I have wanted to create a collection of designs with ivy entwining itself around Celtic ribbon work. 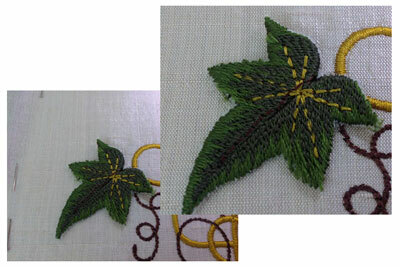 To add variety and other options I have created individual leaves that can be added during the embroidering process to give dimension to the designs. There are four sizes of leaf in this collection but the smallest are not suitable for creating dimensional leaves. 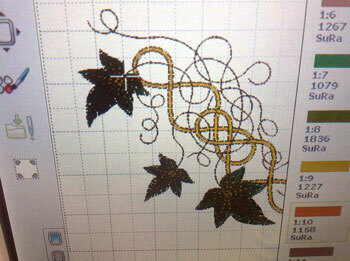 Each of the three larger sized appliqué leaves come in straight form and also with a left or right curve. 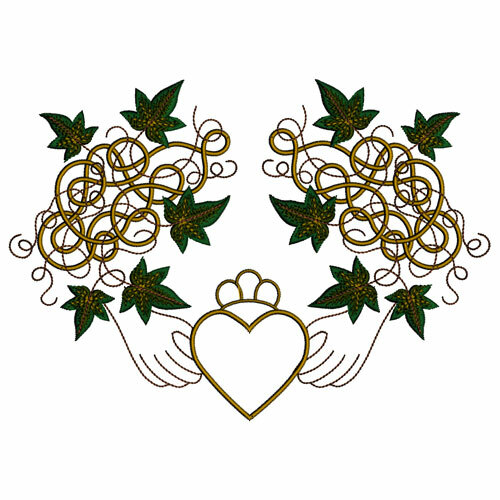 In this first design from the first collection for 4″ by 4″ hoops, you will see that there are 3 leaves. Before embroidering this design I prepared a collection of leaves on organza, and trimmed them ready to be applied to my embroidery work. 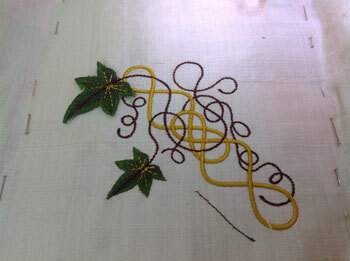 When the design stitches out the little leaf in the middle is stitched after the Celtic ribbon work, then the applique leaves can be added. Here you can see the first 6 colours (Colourway #1 to #6) stitched out in my embroidery hoop on my chosen fabric. I only hooped the stabiliser and then pinned the dupion silk on to the stabiliser, hence the pins. This is my preferred method although sometimes I use 505 Temporary adhesive spray instead of the pins. 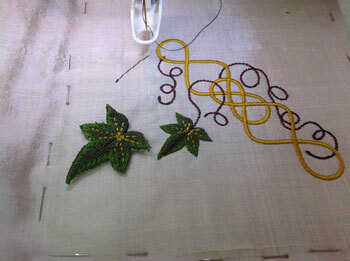 The next 3 colours (Colourway #7 to #9) are not stitched out as they represent the leaves that have been prepared before hand and are now ready to be attached to the embroidery. Colourway #10 is a little line of running stitches, shown above. It marks the line that the holding stitches take when the following colourway is stitched out in back stitch. This will secure the leaf in place. 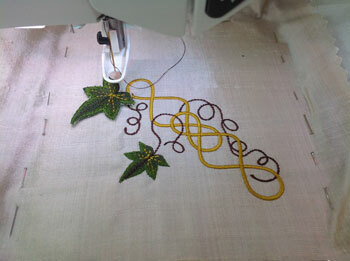 I carefully placed my the first applique (top) leaf using this guide line as well as the display on my machine. I slowed my machine down to its slowest speed. There is no need to pin the leaf in place as the pins could easily get in the way. 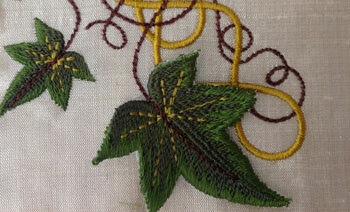 Just hold the leaf with a pair of tweezers keeping them well away from the embroidery foot. For this leaf I restitched the line (Colourway #10) again to make sure it fell in the centre of the leaf. As my machine was slowly stitching I was able to move the leaf and line it up but it did go off line a little bit as you can see, so you will need to perfect your technique. When I was happy with the position of the leaf (remember that it could be easily removed and attached again) I slowly stitched Colourway #11 and when it had finished stitching over the leaf I increased the speed of my machine. I repeated this process for the third (bottom) leaf except this time around I did not repeat the guide line (Colourway #12). That worked better for me but it was my second attempt. How you fix these leaves is down to personal choice and skill but I suggest that you do a little testing and experimentation to see what works best for you. Perhaps the leaf details should not be stitched in such a bright gold colour so inconsistencies do not show when the leaves are attached. White organza shows on the edges of the leaves so green organza would be more appropriate. The use of scissors was difficult to get a neat edge without snipping into the stitches of the ivy leaves, so Fray check was essential to seal those edges. The use of a heat cutting tool would give the perfect finish. For this to work your appliqué must NOT be done on real silk organza. Use only polyester organza instead. I used too thick a stabiliser so I would recommend a water soluble one that can be rinsed out making your leaves lighter. 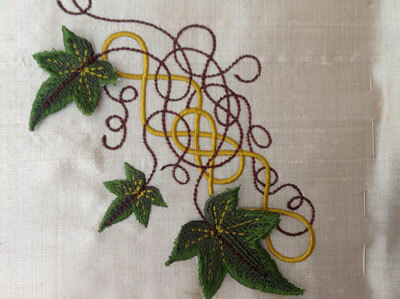 You may want to use green bobbin thread for the appliqué leaves too. It is possible to use a different leaf from the one used in the design. 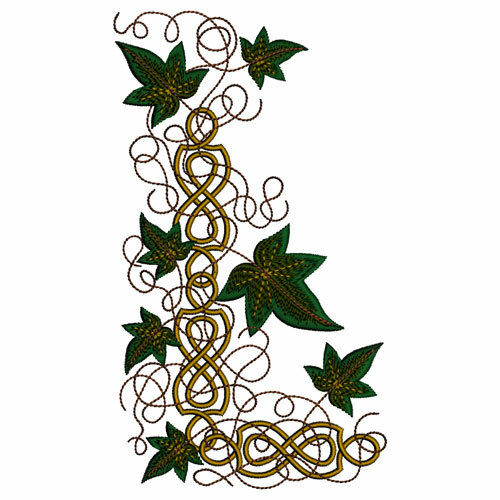 Be sure to check the design first to make sure the stem of another appliqué leaf will not stitch over it and spoil the look. If you would like to Preview and/or Pre order the whole Collection or any of the individual sets then you should join my Embroidery group to get these privileges. After receiving customer requests I have started working on some 8″ by 8″ Quilt Blocks to match the collection. I hope this little blog gives you plenty of ideas of what you can achieve with this exciting new collection. 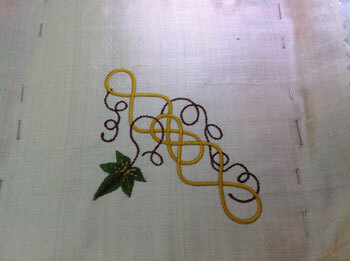 Gallery | This entry was posted in Embroidery projects and tagged Celtic Designs, Celtic Grace. Bookmark the permalink. Hazel, These may be my favorite of all your designs thus far which is saying much since I love them all so. I am working on (in the planning stages) small quilts for my son and daughter for Christmas this year with a Celtic theme that they both love. 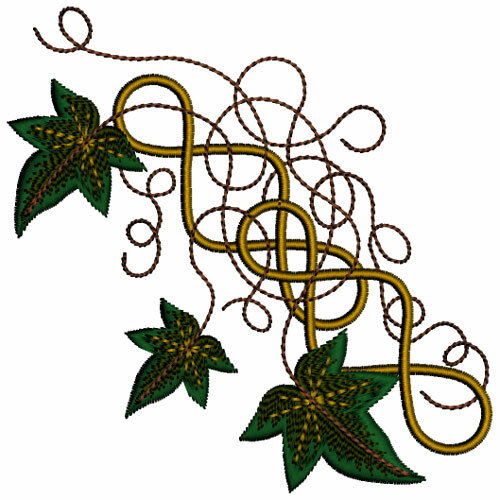 It was a blessing that I found some beautiful fabric after St Patrick’s day this year that wasn’t the usual guady stuff you see but some lovely designs that will mix wonderfully with squares done embellished by the Celtic Ivy designs and maybe some of your others too. Can’t wait to get them and start to work. Maybe this will be a project that I can enter in one of your contests sometime. Thanks and God’s blessings and protection on you always. Thank you for sharing your time and talents with your group – it’s awesome!